*Hardware only and proto-boards are intended for customers already owning a CCS compiler. The DSP Analog Development Kit demonstrates the DSP features of the dsPIC33EP256MU806 on an audio conditioning board. Along with a prototyping board, it includes the powerful PCWHD Integrated Development Environment with compiler support for Microchip's 8-bit and 16-bit PIC® MCU families and an ICD-U64 in-circuit programmer/debugger that supports C-aware real time debugging. This board also includes a Texas Instruments TLV320AIC23B audio codec. This codec allows the user to sample microphone inputs and produce digital signal outputs. The TLV320AIC23B permits sample rates of 8, 32, 44.1, 48, and 96 KHz and the dsPIC® DSC running at 70 MIPS provides plenty of horsepower for user applications. The development kit provides for line in, line out, microphone in, and amplified audio out (for headphones). Exercise tutorial includes examples for reading/writing to the codec using the DMA peripheral. FAT libraries are included in the CCS C Compiler. The character LCD included on the prototyping board provides a user interface for quick development. 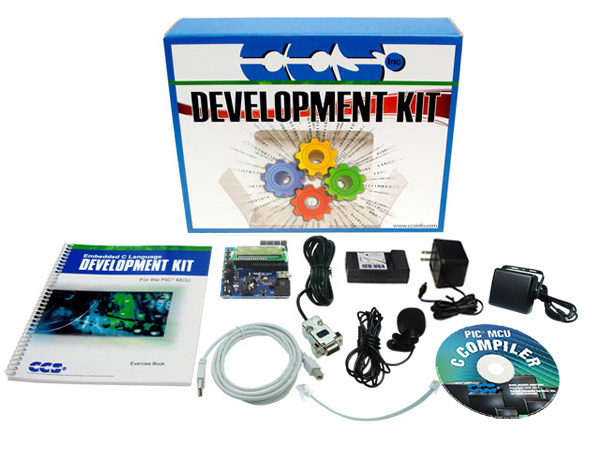 Development Kit comes equipped with a prototyping board. CLRspkr and CLRdsp products from West Mountain Radio are noise reduction products using the Microchip dsPIC33FJ128GP706. 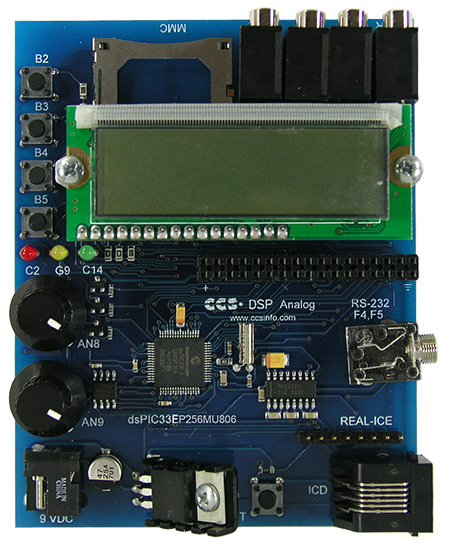 These products have the capability for a user to re-program this board via ICSP using a Tag-Connect and any CCS programmer. Click here to view the Prototyping Accessories.